A photo of Khadijah Britton, who has gone missing, from Facebook. A photo of Khadijah Britton, who remains missing, from Facebook. UPDATE 2/21/18 -- The family of Khadijah Britton has now raised the reward amount to $25,000 for any information leading directly to locating the missing woman. Britton was last seen in Covelo on February 9. Family member Laura Betts messaged us this quote: "The family of Khadijah Britton has increased the award to $25,000 for the safe return of our beautiful Dija Rose! Please give her back. One way or the other just give her back! Khadijah we are still looking for you. Don’t ever doubt how much you mean to all of us. 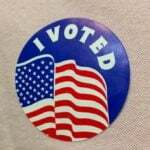 To the people who know what happened please get a conscience and do the right thing. Give her back!!" A Facebook group called "Help Find Khadijah Britton" has been created and a GoFundMe page has also be set up to assist with the search. The primary suspect in Britton's disappearance, Negie Fallis, was arrested on February 19 and more information about his arrest can be found in the article below.The original article relating to Britton's disappearance can be read here. UPDATE 2:15pm 2/20/18 -- The family of Khadijah Britton is now offer a $10,000 reward for any information leading directly to locating her. The reward has been raised from a previous amount of $5,500. A Facebook group called "Help Find Khadijah Britton" has been created and a GoFundMe page has also be set up to assist with the search. More information about the arrest of the primary suspect, Negie Fallis, can be found below. The original article relating to Britton's disappearance can be read here. UPDATE 11:10am 2/20/18 -- The Mendocino County Sheriff's Office has issued a press release concerning the arrest of Negie Fallis, the primary suspect in the disappearance of Khadijah Britton. She has still not been found. On 02-19-2018 the Mendocino County Sheriff's Office continued investigations into the current whereabouts of Khadijah Britton and Negie Fallis, who was wanted on a felony arrest warrant issued on 02-14-2018 in connection with this case. On 02-19-2018 at approximately 6:00 PM Officers from the Round Valley Tribal Police Department responded to a residence in the 23000 block of Road 337D in Covelo, California. The Tribal Officers responded to the residence as they has received information that Negie Fallis was at the location. Upon arrival Tribal Officers contacted Negie Fallis outside the front of the residence and arrested him with out incident. Tribal Officers subsequently transferred Negie Fallis to the custody of Mendocino County Sheriff's Deputies who transported him to the Mendocino County Jail. Negie Fallis was booked into the Mendocino County Jail where he was to be held in lieu of $200,000.00 bail in regards to the felony arrest warrant. 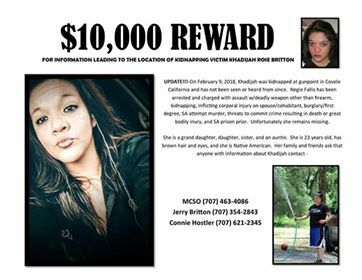 Mendocino County Sheriff's Detectives with the assistance of the Mendocino County Sheriff's Office Search & Rescue Team will be conducting search operations in Covelo on 02-20-2018 in furtherance of the investigation into the whereabouts of Khadijah Britton. MENDOCINO Co., 2/20/18 -- Negie Fallis, the primary suspect in the disappearance of Khadijah Britton, has been arrested and booked into the Mendocino County jail on charges of attempted murder, kidnapping, burglary and other crimes. Britton has not yet been found. Fallis's bond was set at $200,000. 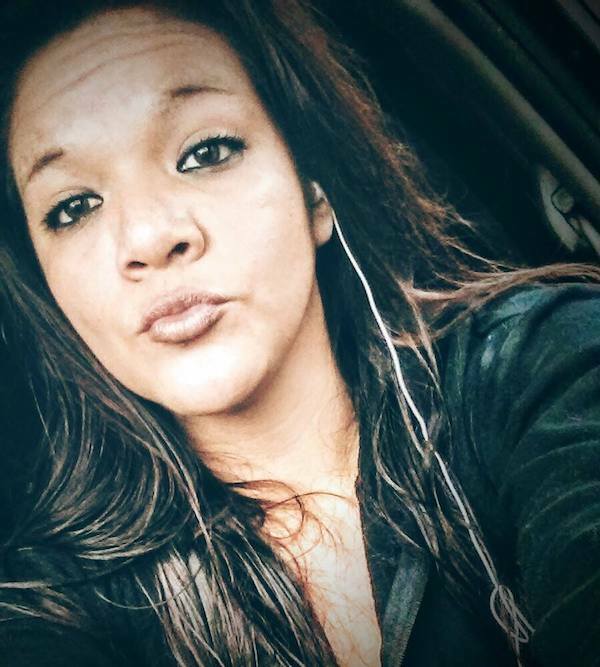 Britton, 23 of Covelo, was last seen on Feb. 9, and and family, community, the Mendocino County Sheriff's Office (MCSO) and the Round Valley Tribal Police have been searching for her for over a week. Speaking about Britton, Captain Greg Van Patten of the MCSO explained that, "Her whereabouts are still unknown, we're following up on some leads today." He added that, "We have some search and rescues locations to follow up on today...and at this point we're definitely a little closer than yesterday." The full list of charges against Fallis, 37 of Covelo, are: Assault with a deadly weapon other than a fire arm, kidnapping, inflicting corporal injury on a spouse/cohabitation person etc., felony burglary, attempted murder, threatening to commit a crime resulting death or great bodily injury, "SA prison prior." 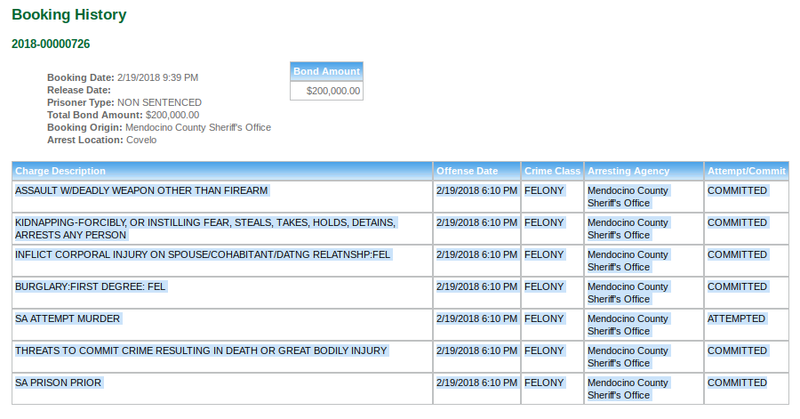 A screenshot of the charges against Negie Fallis, from the Mendocino County Sheriff's booking log. Also a Facebook group called "Help Find Khadijah Britton" has been created. 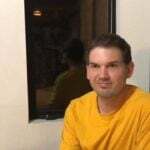 The Mendocino County Sheriff's Office is soliciting the public's assistance in locating a missing person who was possibly abducted and is considered "At Risk". The Mendocino County Sheriff's Office has been investigating a domestic violence incident, involving and armed subject, who may have abducted his girlfriend at gunpoint. The Sheriff's Office was contacted on Monday, February 12th, about a possible kidnapping that occurred on Friday, February 9th, around midnight. Sheriff's Deputies spoke to witnesses who advised that Suspect Negie Fallis arrived at the location, armed with what appeared to be a small derringer pistol, and demanded his girlfriend, Khadijah Britton, exit the residence and speak with him. Witnesses indicated Khadijah exited the residence where a physical altercation occurred between the male and female before they both entered a black Mercedes sedan and left the location. Khadijah has not been contact with family since that time. Negie who was wanted in connection with a previous domestic violence incident in January, related to the same victim, is also outstanding at this time. The case was assigned to the Mendocino County Sheriff's Detective Unit for continued investigation. Fallis is known to frequent the Willows are and the Grindstone Rancheria in Glenn County, Lake County, and Covelo. We are requesting anyone with information related to the whereabouts of either individual to contact the Mendocino County Sheriff's Dispatch Center at 707-463-4086 or the Sheriff's Tip line at 707-234-2100. The family’s hope of finding tribal member, Britton, lies with the abductors. The man. He is in jail and options limited. Plea deal ..he’ll talk. This woman 180 lbs jumped on his back. There were issues. There was drug use and due to her death..She is cold. As a native American, both of them..that monkey on dude’s back is coming thru.why do I think small chold..Plea deal..bury the body sacred ground. Tell him it’s true..the spirit thing. Lights go on, things move..grabs the wheel off the road kinda monkey from a murdered soul.